What does Rory MacDonald have that Gilbert Melendez and Josh Koscheck don’t have? 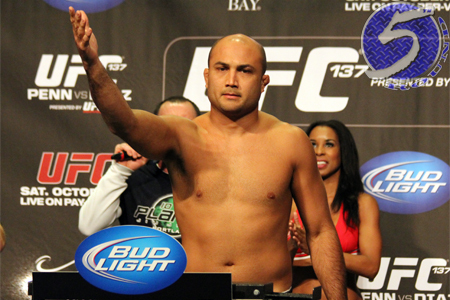 The ability to draw BJ Penn (Pictured) out of retirement. While appearing as a guest on The MMA Hour, MacDonald respectfully called for a shot at the former multi-divisional UFC champion. On Tuesday evening, Penn professed he’s more than willing to cut his premature retirement short to face the skyrocketing 22-year-old. “Rory, I accept your challenge!” Penn stated on his official website. Penn abruptly called it quits after dropping a convincing unanimous decision loss to Nick Diaz at UFC 137 in October. The Hawaiian claimed a return wasn’t out of the question as long as the challenge got his blood pumping, but scraps against Melendez or Koscheck didn’t quite pique his interest. However, MacDonald is far from a gimme. “Ares” owns a practically perfect 13-1 record, with his lone blemish coming against now-current interim welterweight champ Carlos Condit at UFC 115. Penn holds a 16-8-2 professional mark and donned the UFC welterweight and lightweight titles during his illustrious career. Now that the who is set, it’s up to Octagon officials to determine the when and the where. If MacDonald gets his way, the 170-pounders will collide September 22nd when the UFC returns to Toronto.